Some 81 percent of Germans think their country has a growing problem with political extremism, a recent survey by YouGov and Statista found. Only 12 percent of respondents said political extremism isn’t much of a problem. The lion’s share of respondents - 78 percent - believe that German authorities have lost control of the problem. Three in every five Germans (61 percent) have thrown their weight behind the idea of enhancing the struggle against all kinds of extremism, from the far left and the far right, the survey showed. At least 46 percent of respondents believe that radical political parties should be banned. Almost as many, 43 percent, believe that enhanced CCTV surveillance would be a good way to tackle political extremism. About two in five people (41 percent) want left-wing centers (like Hamburg’s Rote Flora) to be shut down and a stronger police presence at political rallies, the survey revealed. Germany's police crime statistics report revealed in late April that at least 3,372 cases of politically or ideologically motivated crimes by foreigners were recorded in 2016 - up 66 percent compared to 2015, Focus reported. The far right accounted for the biggest number of politically motivated crimes - some 23,555 violent acts out of a total of 41,549 in 2016. 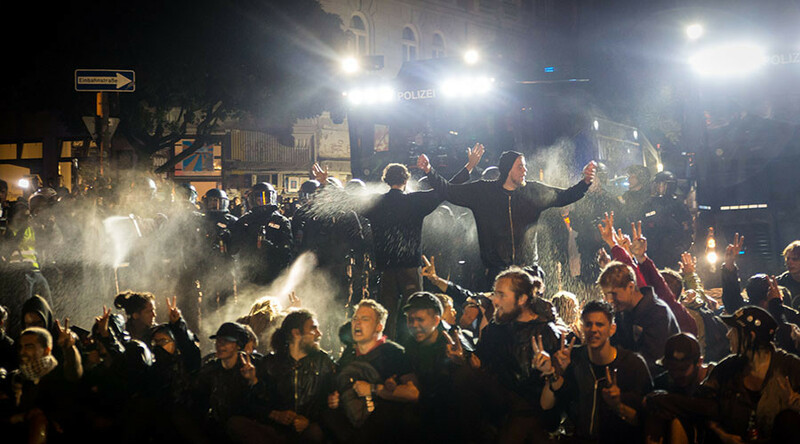 A series of violent riots that shook the northern port city of Hamburg during the G20 summit earlier this month provoked a wave of indignation among German politicians, who demanded a radical change of approach toward violent protests, as well as to left-wing extremism. “Germany’s image in the international community has been severely damaged due to the incidents in Hamburg,” German Foreign Minister Sigmar Gabriel told Bild following three nights of violent clashes between the left-wing radicals and police.